Our San Francisco blogger friend Meesh from Right Where I Left Off shared this creative DIY with us. She transformed her simple white Dainty Chucks with geometric designs and colorful embroidery. 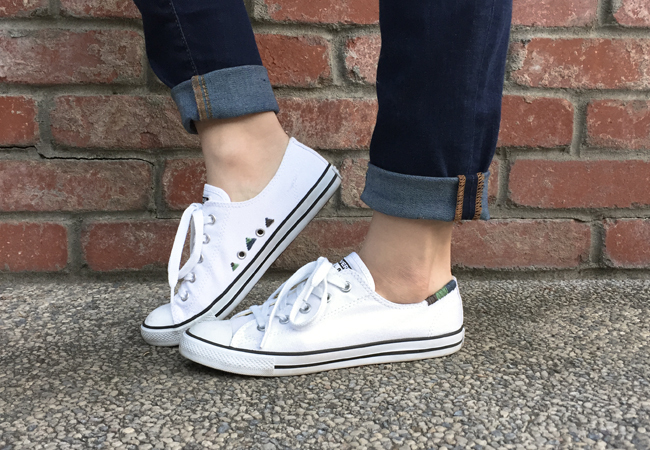 Keep reading to see how to customize your own embroidered Dainty Converse. Step Two: Add embroidery floss on the collar of Converse using three different colors. Step Three: Unlace the shoes to allow better access when embroidering. Place the triangles on the side of the arch of the shoes. To create the triangle make the base with a single stitch. Then work your way up decreasing the stitch length with each pass. Step Four: Snip any loose threads. Here are your new customized embroidered Dainty Converse!